Surtees/Yamaha Grand Prize winner Sandra Flay being congratulated by Hutchwilco New Zealand Boat Show general manager Dave Gibbs (left) and Surtees Boats sales manager Cliff Schick. The 61st consecutive running of the Hutchwilco New Zealand Boat Show, in Auckland in May, was another huge success. Over 30,000 paying visitors turned up to see all the latest models from the country’s leading GRP and aluminium boatbuilders. They obviously liked what they saw with Kiwi boat manufacturers and importers securing multiple orders from all over New Zealand. At least one major alloy manufacturer sold over 40 boats, while one major GRP boatbuilder secured over 20 orders, saying it was their best show since 2007. The major fishing retailers also reported extremely strong sales, especially over the weekend, as thousands of keen anglers took the chance to learn new skills and refresh their equipment lockers. Apart from all the new boats, engines, electronics and equipment, the other major drawcards were Kiwi “Shark Man” Riley Elliott, the Youthtown Aqua Fun Zone for children, the extremely challenging Hosking Trailers Backing Competition and the chance to win a huge range of prizes including a $100,000 Surtees/Yamaha Grand Prize Package, Viking Kayaks, Heletranz Heli-Fishing Trips and fishing charter experiences to places such as White Island, Rarotonga and Nuie. Sandra Flay, an overjoyed kumara farmer from Dargaville, came to the show on Saturday with her family and found out the following evening that she had won the $100,000 Surtees/Yamaha Grand Prize Package. It was handed over the following week and she is now planning extensive fishing trips around the Kaipara Harbour. 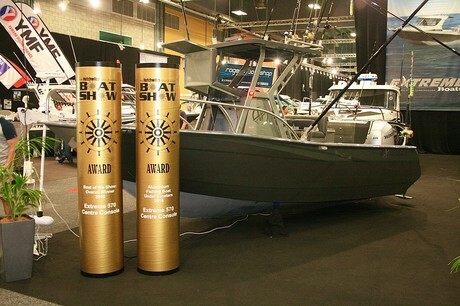 This year’s coveted Boat of the Show: Overall Winner was won by the Extreme 570 Centre Console (below) which also collected the Boat of the Show Aluminium Fishing Boat Under 6 Metres. Hamilton’s Gary (Rollos Marine) and Greg Dutton (DMW Trailers) were inducted into the New Zealand Boat Show Hall of Fame.